Black Ice Software - Print2Email version 9.40 is released! 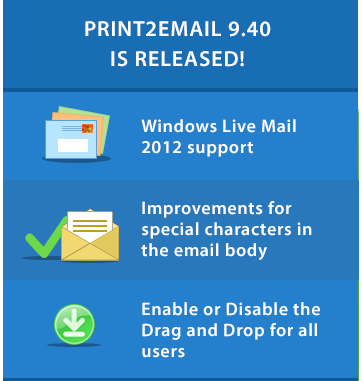 Print2Email version 9.40 is released! Support for Windows Live Mail 2012 and more! Black Ice Software has released version 9.40 of the Print2Email. This version includes support for Windows Live Mail 2012 allowing users to convert documents and send via email quickly and easily with Windows Live Mail 2012! The latest release of Print2Email also includes improvements to Disable or Enable the Drag and Drop window of Print2Email for all users. The new Drag and Drop window configuration is included in the MSI installer, designed for large scale deployment in an Active Directory environment. Print2Email version 9.40 includes improvements for sending certain special ANSI characters with an accent in the email body through SMTP, or through predefined email providers, such as Gmail, Hotmail and Yahoo.